Saturday's mission, if you choose to accept it, is to appear over Littlehampton at exactly 12:00 noon, towing the message: "Fi I love You - Please Marry Me - Joss X". 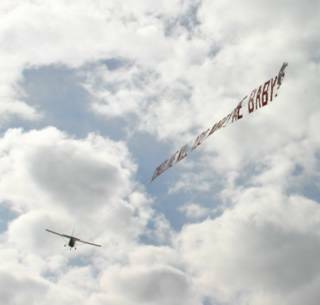 Not sure if we'll pick the banner up from Goodwood or Bracklesham Bay but obviously the message is getting out, if you want to propose to your girlfriend with impact, then call in an airstrike from Airads! Sunday should be interesting. First tow for the London Erotica Show and rumour has it that I may have to wear stockings and suspenders under my flying suit!